Indigenous to North America and the southwestern United States, wild cherry is an eighty-foot tree with a black bark and oval leaves with small teeth. It blooms with white flowers and deep purple fruit. 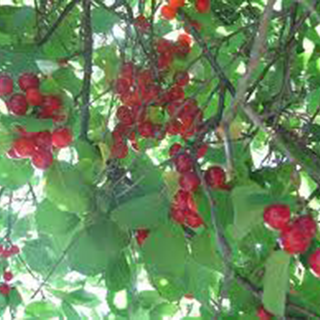 Wild cherry is often found in small amounts in blends and syrups for bronchial and respiratory disorders. Take the recommended amount. You can start from seed in a pot indoors or plant it outside. Plant seeds about 1/2 inch deep in nutrient-rich well-drained soil with exposure to full sun. However, wild cherry trees are ideally started from propagation to reduce the waiting time for mature fruit (which can take 7 to 10 years). Plant the new cherry tree into its new home when it is 40cm tall. The cherries turn from green to red to almost black around the middle or end of July. The fruits can be pulled from the tree individually. It is also possible to pick cherries or the stones (cherry seeds) from off the ground.